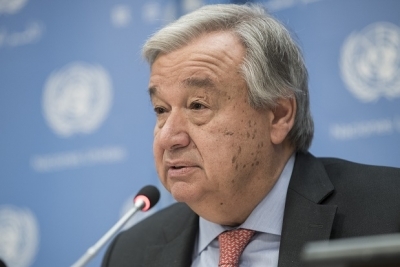 United Nations July 12 (IANS) UN Secretary General Antonio Guterres reiterated on Monday his offer of "good offices" to leaders of India and Pakistan to find a solution to their outstanding issues. Asked at his news conference if he was doing anything about the rising tensions in Kashmir he said: "Whenever I meet the leaders of both India and Pakistan I always offer my good offices and I hope that (in) the future (they) will be able to create the mechanisms of dialogue that will allow for this problem to find an adequate political solution that the people can benefit from." "It is clear for me that only political solutions can address political problems " he added. India has consistently rejected mediation efforts by Guterres or others saying that the two countries had accepted in their 1972 Simla Agreement that it was a bilateral matter and therefore third parties had no role in resolving it. The agreement was signed by Prime Minister Indira Gandhi and Zulfikar Ali Bhutto who was then the President of Pakistan.